When You Take A Shower, Where Does It Take You? Breathe deep. Let go. And Lose Yourself In The Wonder. 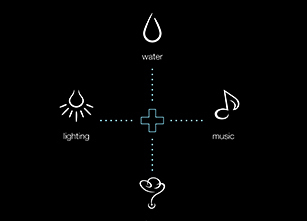 Experience an orchestrated interplay of water, sound, steam and light with our most advanced showering system yet, DTV+. Our DTV or digital thermostatic valve (DTV) system controls four elements to give you a true multi-sensory showering experience. Customize every element of your showering experience to your needs and control it through the touch-screen interface. An experience like no other, and it’s from Kohler. Transport yourself to someplace else with pre-programmed spa therapies inspired by Sebastian Kneipp’s revolutionary wellness therapies, also known as the ‘Kneipp cure’. Featuring pre-programmed spa therapies scripted with the help of Anne Bramham, the world’s premier spa consultant, and inspired by one of three themes: Relaxation, Well-Being or Energy, the DTV+ takes your daily shower and transforms it into something ultra-luxurious and indulgent. The three themes are like your own personal 7-minute long playlist, that rejuvenates your mind and body. The individual steps can be repeated or skipped, and the intensity of each experience can be customised to each user. The interface automatically notifies you when new experiences are available. The sleek and smart DTV+ touchscreen interface eliminates the need for multiple levers and knobs of a manual shower, giving your bathroom a clean look. 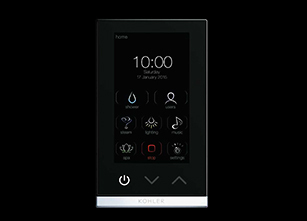 The touchscreen provides a convenient, intuitive way to control every aspect of your shower to the last detail, providing a truly unique experience for every user. From precision temperatures to timing and coordination between shower components, every element is available for customisation to create a shower experience that is uniquely yours. From the full, rich coverage of a rain head to the targeted streams of body sprays to the spa-like hydrotherapy of multifunction showerheads, the modular nature of DTV+ helps you choose the components that best suit your needs to design your own personal shower experience.